You’ve seen the headlines and maybe have read the stories. Like a broken record, both figuratively and literally, beef prices continue to skyrocket. While many joints have increased prices, they haven’t increased them to match the rate of increase of their own cost. This means that they are making less profit on the beef they sale, and in Texas barbecue it is beef that sells the most. Locally in the Tomball area, I watched two small joints open and close in 2014; Son-of-a-brisket and Nate’s Place. Both showed promise and it was sad to see the dreams of these folks first be realized and then crumble in such a short time. Even the great names are struggling with pricing. They want to increase the price but they know that consumers are sensitive. Barbecue was traditionally the cheapest cuts of beef, smoked to prevent spoilage and sold as a side business while the meat market sold the more popular cuts as their main business. An intersection of popularity combined with the effects of drought has caused beef costs to continue to increase with no short term relief in sight. Brisket, unloved many years ago and traditionally an inexpensive cut, has now become a thorn in the side of barbecue restaurant owners. They are faced with the catch-22 of needing to increase prices without alienating customers and driving them to their competition. Over the last few months I’ve seen the average price for a pound of “moist”, or “fatty”, brisket to hover between $16 and $18 at most places I visit. There are several places in the Austin area now charging $20 and I would expect the prices to continue to increase into the summer. I would not be surprised to see $22 prices soon, and even possibly $24 by the end of the year if things continue on their trajectory. There are some outliers. 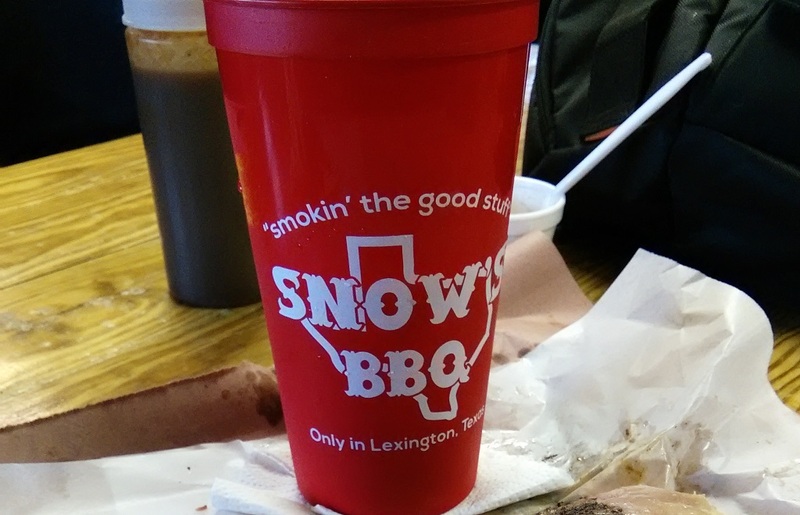 One of note is Texas Monthly top 5 ranked Snow’s Barbecue. They were still selling brisket at $13.95 a pound on my most recent visit but I would be surprised if they didn’t move upwards to $15 a pound soon. They’ve also added free plastic cups to their always free beans making them one of the single best values across all joints, but at a price that makes me wince. It does make for a great reason with the low fuel costs to make the trip out on a Saturday morning. 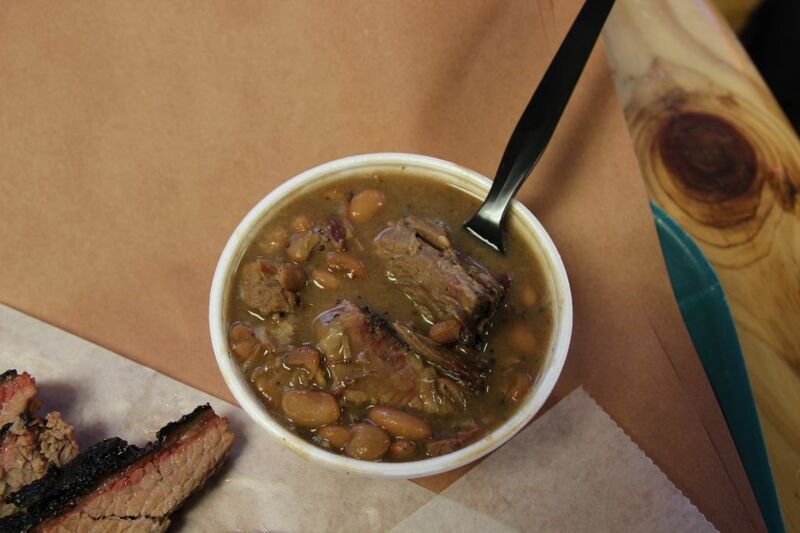 Don’t blame your local barbecue joint for the high prices. They are doing their best to keep costs in line. I can assure you they are not raising their prices simply because they are doing brisk business and want to be greedy. In fact, as mentioned earlier, many have raised their prices at a ratio lower than the cost increase and some have not raised their prices at all, enduring less profit margin each month. Some have continued to use Prime grade briskets while keeping their prices in check, such as Killen’s and Corkscrew, while some have upgrade to Prime in an effort to provide value, such as Louie Mueller. There are still a number of joints clinging on to pricing near $16, but with my opinion of $18-$20 being appropriate for the current moment, anything at or below $18 is a bargain. The freebies are still there too. At least for now. Bread, pickles, onions, crackers, and at some places the beans are still served up complimentary and endlessly. This is also the result of long standing tradition. When the old smokehouses sold meat, customers had to purchase any sides from the general market usually in the same building. A loaf of bread, bottle of sauce, or other condiment that was not fully consumed would be left around for others to enjoy. Over time as the smokehouse became the primary business and the general market faded away the owners of the establishments began providing the condiments themselves. You may not think twice regarding a loaf of bread, but one owner spent $25,000 on bread costs alone in 2014. Throughout 2014 and thus far in 2015 I’ve spoken with many owners who are trying to remain profitable by tweaking other aspects of their business. They don’t want to change but the economies of beef are forcing their hand. They are struggling with trying to remain in a business steeped in over a hundred years of tradition while making necessary modifications to stay afloat. Here is a list of 10 recommendations for consumers where the amount of meat doesn’t need to be reduced, but by following one or more of these you will help out your local barbecue joint. If you do nothing else and do not change any other single thing, pay with cash. Have you noticed many gas stations offer a cash discount? Ever been to Spec’s liquor where they also offer a discount for using cash? In order to process your credit card, the processor charges a fee of around 3%. This fee is on the entire transaction, including any tip. While 3% may sound trivial to you, it adds up quickly. One owner replied these fees cost them anywhere from $2,500-$4,800 per month over the last year. That’s a cost that would simply vanish if it was all cash instead. If you aren’t already, consider tipping. Any amount helps even if it’s just coinage. 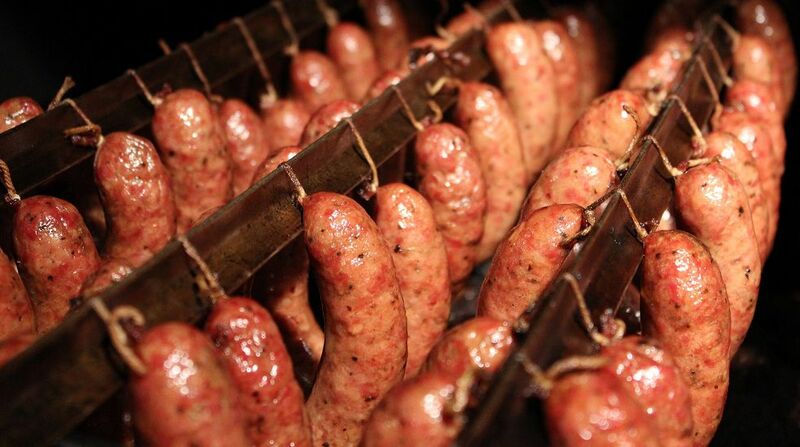 Ever tried the jalapeno cheese sausage at Hays County? How about the chipotle at Louie Mueller? Deer Sausage at Gatlin’s or Brooks’ Place? La Barbecue and Franklin both offer some outstanding sausage options that are pretty much a must-have when visiting. Black’s had a seasonal hatch chili sausage in the fall that I fell in love with. The occasional joint will have smoked boudin available, and it could be worth checking out. The link I had at Pappa Charlie’s was outstanding. Order more than one type of sausage where available and expand your taste buds. They vary in taste greatly, but I generally prefer in-house made sausage. I had been skipping over the turkey and chicken choices until someone recommended the turkey at one of my favorite joints. It was smoky and flavorful but most of all it was moist. The texture was unlike a common thanksgiving bird, it was soft and delicious. Not all joints can nail it and I’ve had some dry turkey, but there are many that crank out a great product. 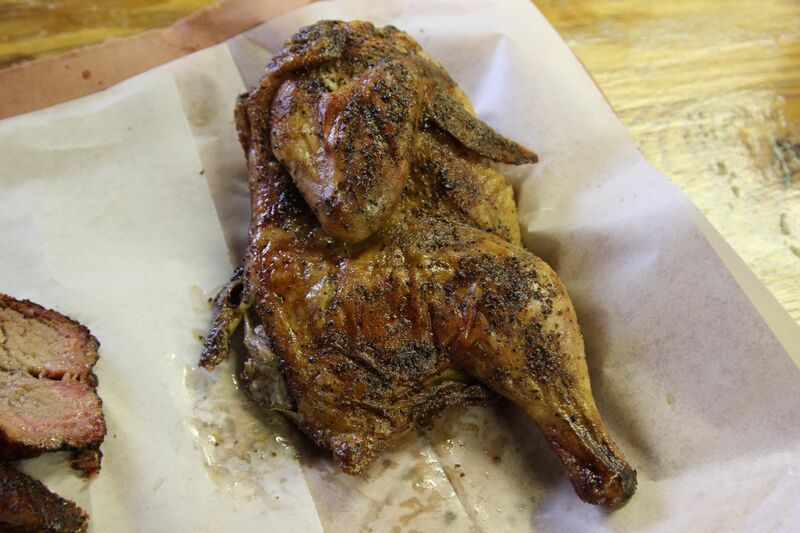 I had some of my first barbecue joint chicken recently at Snow’s and it was great. It was also only $5.50 for a half a bird, which helps stretch my barbecue dollar while still providing delicious smoked meat. I will admit I’m not a fan of most joint’s pork options, and of pork in general. It may have been from my earlier experiences with bony pork ribs lacking meat that saw very little smoke but my experiences in 2013 and 2014 changed my perspective. 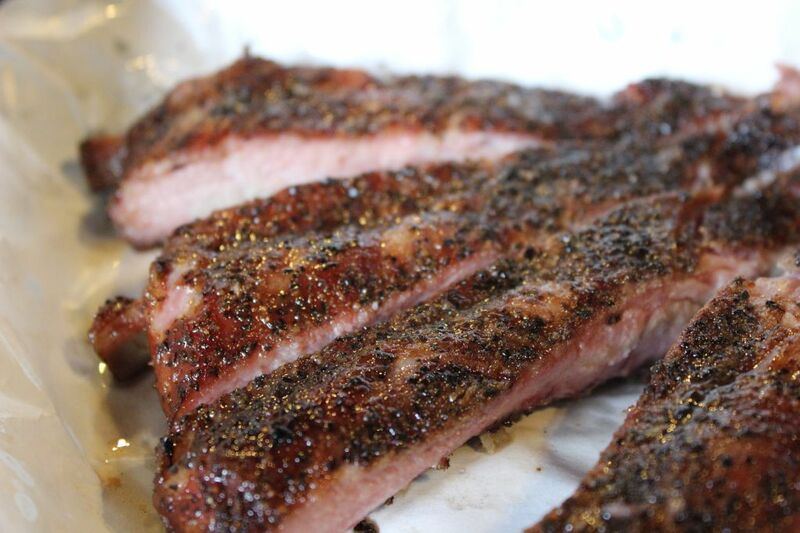 A few great choices are the pork ribs at Killen’s, baby backs at Opie’s, and pork chops at Hays County. Often only a buck-fifty or so to purchase and easy money for your local joint, add a drink when you can. The bottles of Big Red do have a special appeal, but there is more profit in the fountain or iced tea. Potato salad, cole slaw, or baked beans are common but if you venture beyond your comfort zone you might discover some great options. Opie’s: Tater Tot Casserole, Pecan Cobbler, and Butter Beans. John Mueller: Cheesy Squash and barbecue sauce. Yes I consider his sauce a side dish, and yes I slurp it like a drink. Killen’s: Creamed Corn and Bread Pudding. Many joints offer the bottles in-house, while a few offer them online, and a few others are also available at Texas HEB Stores. 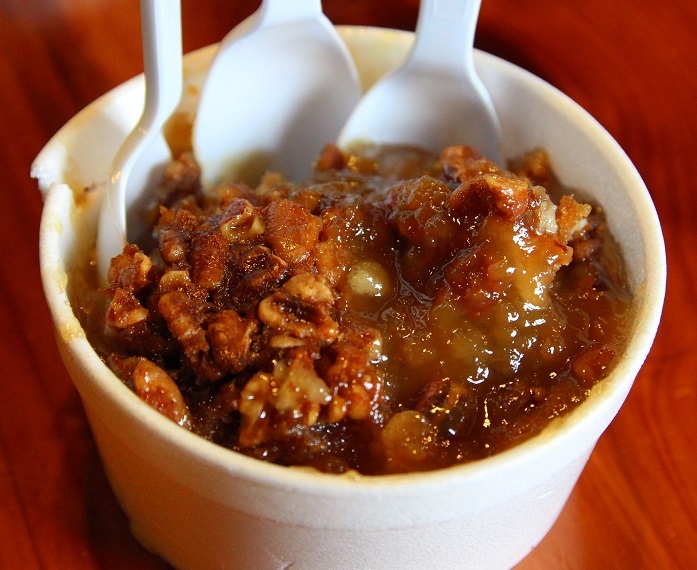 It’s a great way to kick up your own baked beans, hamburgers, meatloaf, casseroles, and more. Next visit to HEB try the Franklin Espresso, and check out Hays County and Louie Mueller sauces debuting January 19th. Hays County’s popular sauces finally become available all across Texas. Wayne Mueller and team crafted new sauces specifically for the 2014 Gettin’ Sauced festival and the sauces where such a hit that they were moved into retail. I have a big collection of BBQ shirts! While the profit margin may rival other options, you will be doing the joint a favor each time you wear their shirt in public (as long as you don’t act like a jerk, so don’t do that.) Most pit masters would also gladly sign the shirt for you so bring a marker. While I endorse supporting all joints, I am partial to the rock and roll themed shirts at Opie’s. 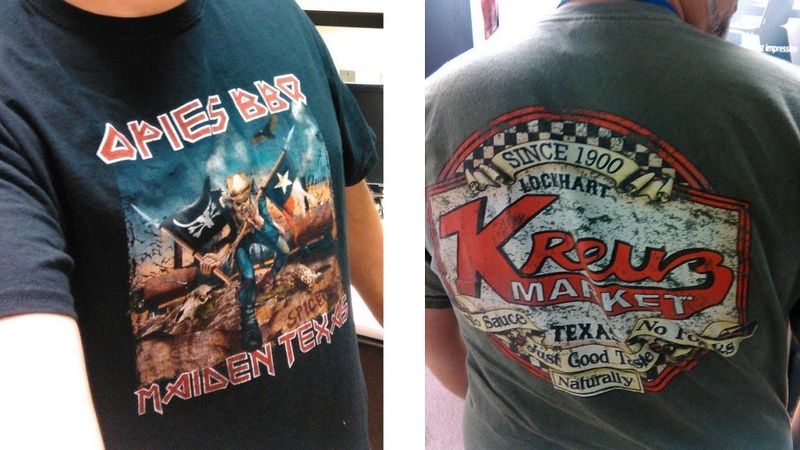 When you do wear a shirt from a BBQ joint, snap a picture and use the hashtag #bbqshirtday to spread the word. A special thanks to those who were interviewed for this article, keep smokin’ !